Angel food cake has always had a special appeal to me. When I was growing up, it was a tall, airy treat that my mom purchased ready-made when strawberry season arrived. I would request a thick slice, hide it under a mountain of fresh and juicy strawberries, and add a cloud of whipped cream on top or a scoop of ice cream for something different. The incredibly light texture of the cake barely held the fruit, giving each spoonful a pillowy bite. Years later, I happily discovered that this enchanting cake was naturally made without dairy products: not only was it lighter in terms of caloric content, but also it was one of the few treats I could indulge in with abandon. Today it’s actually one of my favorite cakes of all for the lightness of its crumb. I love that you can indulge in a generous slice without feeling so heavy or guilty afterward. 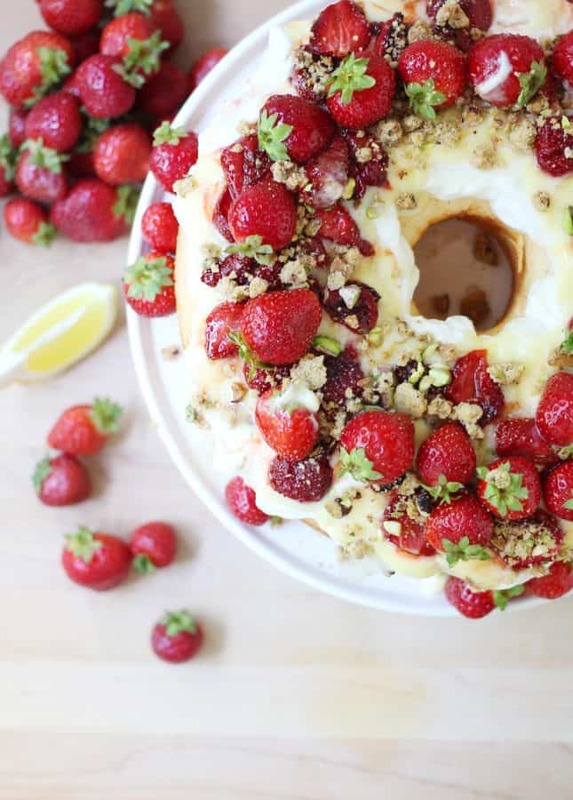 This cake is not your run-of-the-mill angel food cake: the delightful, colorful way it’s dressed pushes it to special occasions-worthy levels. It’s the best way to make use of the strawberry fall crops—and to keep on denying that summer’s actually coming to an end. 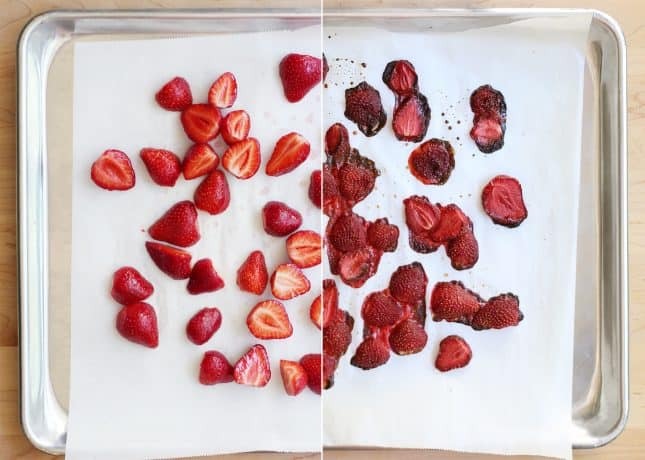 If you’ve never roasted strawberries, you’ll quickly fall in love with this technique. Strawberries, lightly dressed with maple syrup and roasted for a half hour, come out slightly shrunk in size but magnified in taste. The fruit tastes like it just came out of a sweet compote but without the added sugar. Though it may sound counterintuitive to roast berries at the height of their seasonality, it can be great to use fresh produce differently once in a while. Plus, you’ll remember this trick when winter comes: roasting strawberries is a sure way to make ho-hum berries much tastier. Although assembling the cake requires you to prepare many components, you can also save time by taking shortcuts I’m providing in the “Fast-Forward Substitutions” section below. After all, the true revelation in this dish is the homemade angel food cake: As impressive as it looks and tastes, it’s quite easy to make. All you need is a tube pan, and you’re on your way to tasting a life-changing version of a cake you likely forgot or never realized could be this good. 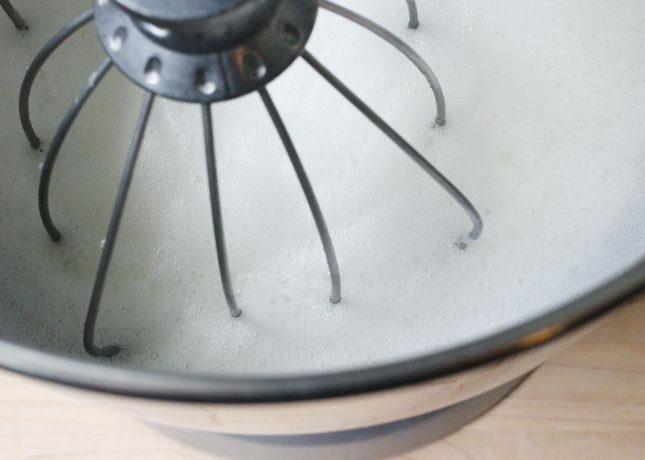 Make sure the tools you’ll use to beat the egg whites are squeaky clean. This tip applies to whenever you need to beat egg whites until stiff or into a meringue. Egg whites are temperamental, so any greasy residue (even one that’s nearly invisible to the eye) will prevent you from achieving the result you’re looking for. If you haven’t used your accessories in a while, before you start beating the egg whites, wash the whisk(s) and bowl in very hot water with dish soap and then dry with a clean towel. Putting everything in the dishwasher works, too. Don’t skip sifting the powdered sugar and the cake flour. 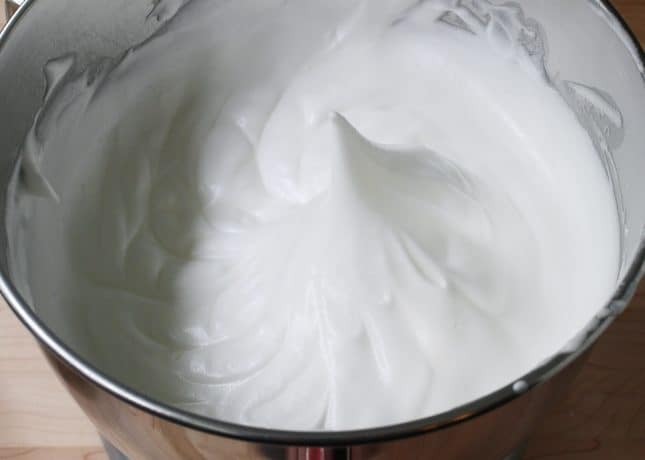 Both are essential to producing a smooth batter, and because whipped egg whites need to be treated gently, you won’t be able to beat the batter to remove lumps if you neglected to sift. Speaking of flour, make sure to use cake flour. 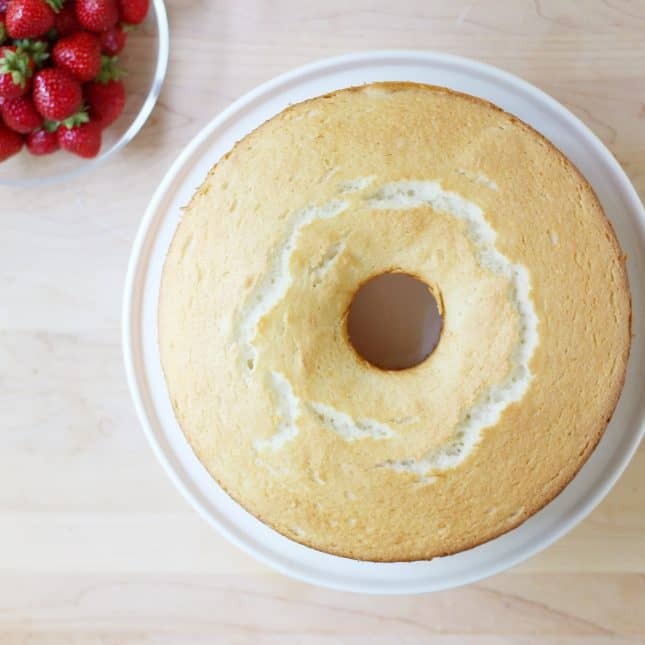 This is not optional: Cake flour has a lower gluten content, which produces a softer crumb—a quality you’re definitely looking for when making angel food cake. You can use the remaining cake flour in any and all cakes, including cupcakes and muffins. 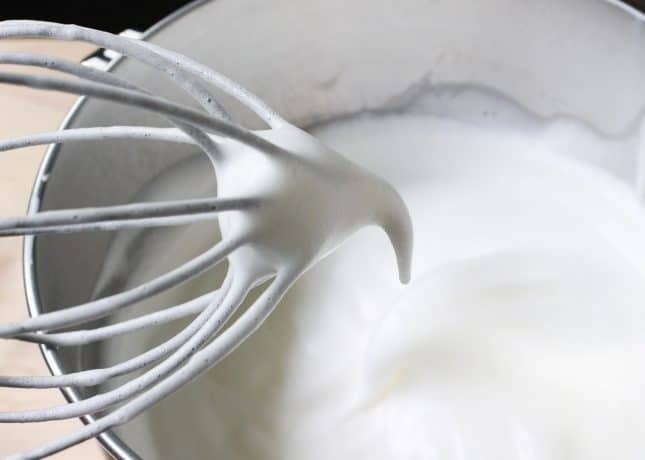 Treat the whipped egg whites extremely gently. You need to carefully fold the flour into the meringue so you don’t deflate it. A fluffier batter will produce the fluffiest cake. Make sure to use a tube pan with a removable bottom. The center tube should be higher than the outside of the pan. 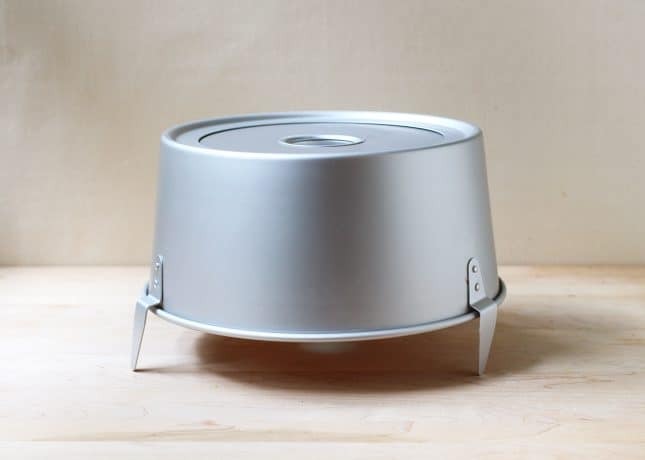 This will allow the cake to cool properly when you turn the pan upside down. Some tube pans even come with handy small feet to allow for a more efficient cooling process. Carefully pour the batter all around the center tube, then use a rubber or silicon spatula to even out the top of the cake. The batter won’t even out while baking, so making sure the batter is evenly distributed will produce a more beautiful cake. There you go! The tips make it sound like it’s a more complicated process than it really is; it really only takes minutes to prepare the cake batter. 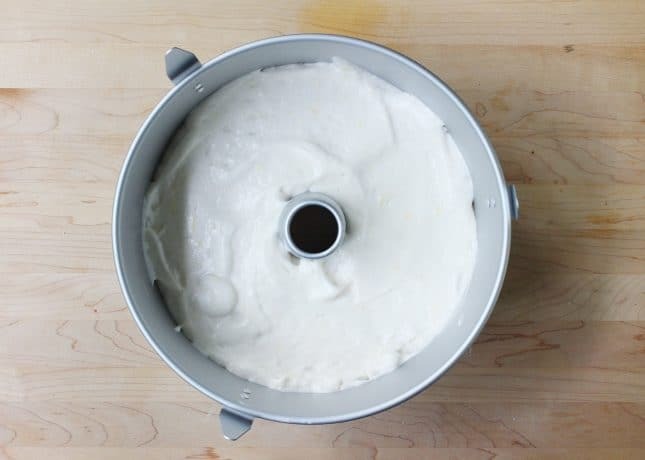 In fact, the hardest part of making homemade angel food cake may be finding a tube cake pan! 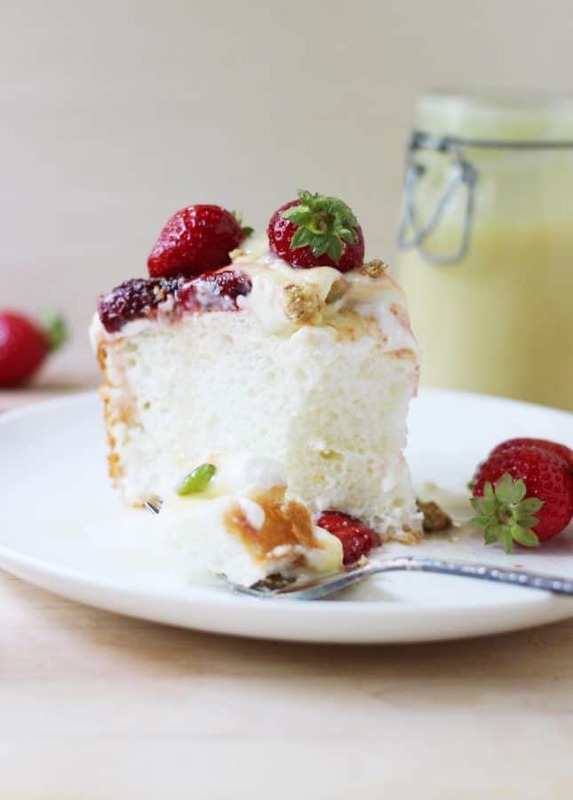 Make sure to check out my short How to Make Angel Food Cake video to visualize the process. 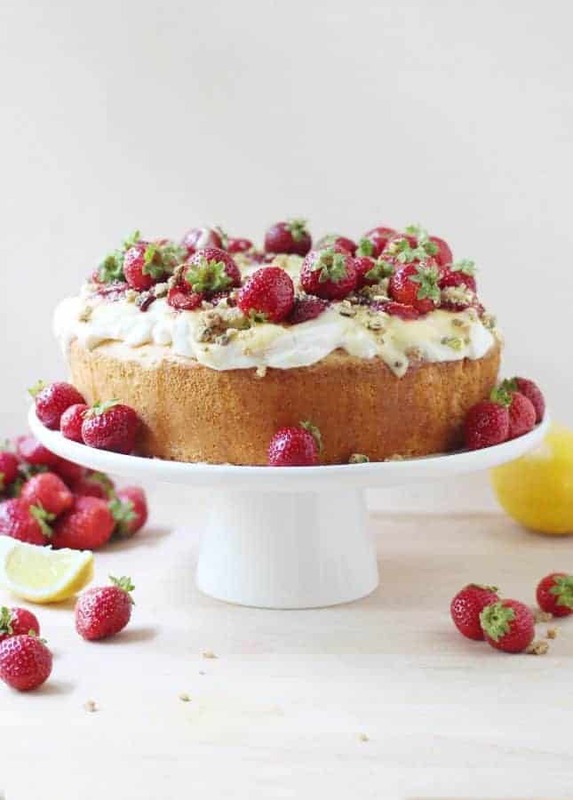 This recipe combines the cake’s delightful citrus aroma with aromatic strawberries, rich pistachio crumbs, creamy yogurt, and even a (generous) drizzle of maple syrup. Please help yourself to a generous slice! 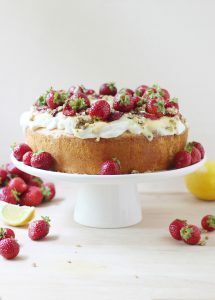 This angel food cake combines zesty lemon, aromatic strawberries, rich pistachio crumbs, and maple syrup. 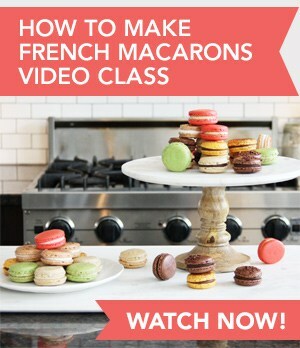 Includes a helpful how to video! Make the cake: Preheat the oven to 375°F (180°C). 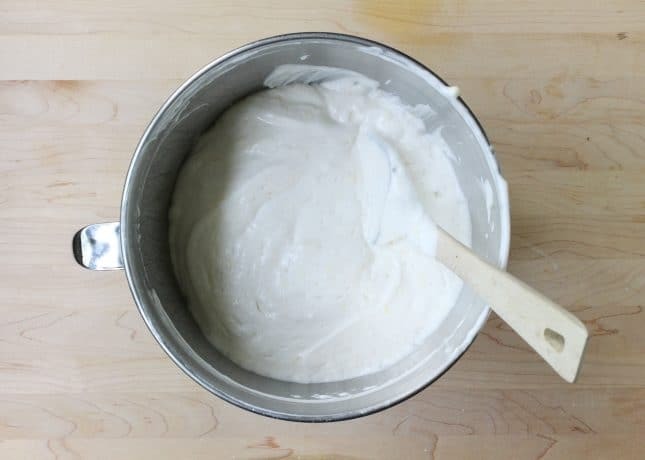 In the bowl of a stand mixer fitted with the whisk attachment (or in a large mixing bowl, if you’re using a handheld mixer), measure the egg whites and whisk until foamy. Add cream of tartar and beat until soft peaks form. Keep on beating, adding the sifted powdered sugar a couple of tablespoons at a time, until all the sugar is incorporated and stiff peaks form. Add the lemon zest and fold to incorporate. If you’re using a stand mixer, remove the bowl from its stand. 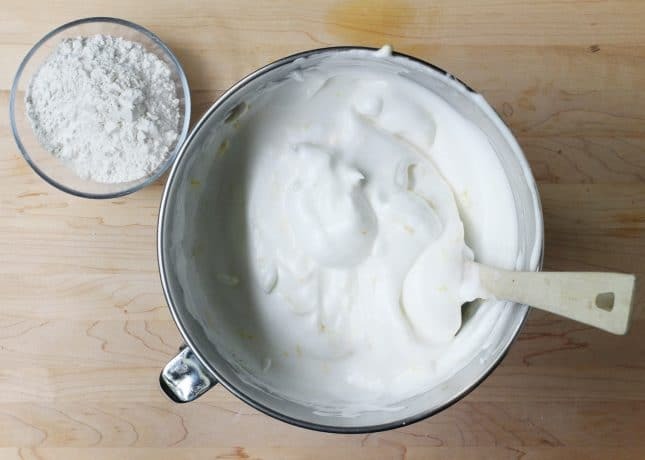 Using a spatula, gently fold in the sifted flour in four batches by repeatedly cutting the spatula in the center of the mixture then coming up the sides. Transfer the mixture into an ungreased tube cake pan with a removable bottom. Even out the top of the cake. Bake for about 30 minutes or until the cake is golden and a toothpick inserted in the cake comes out clean. Invert the pan onto a wire rack and let the cake cool completely--don’t worry, it won’t slip out of the pan! To unmold the cake, run a sharp knife around the inside of the pan, and lift the center part with the cake sitting on it. Run the knife around the center part of the cake and along the bottom to loosen it, and remove the pan and set onto a serving plate. Make the roasted strawberries: Preheat the oven to 350°F (175°C). Line a baking sheet with parchment paper. Place the halved strawberries in a bowl and pour the maple syrup over. Toss so the strawberries are evenly coated with syrup. Roast for 30 minutes. Set the baking sheet over a rack and let the strawberries cool completely. Make the pistachio crumbs: Preheat the oven to 350°F (175°C). Line a baking sheet with parchment paper. In a large bowl, mix the flour, sugar, and chopped nuts together. Add the butter and incorporate it into the dry ingredients using a pastry cutter, a fork, or your hands until the mixture forms pea-sized crumbs. Spread the mixture on the cookie sheet and bake for 10 minutes until the crumbs are golden (mixing the crumbs two to three times during baking allows them to brown more evenly.) Let cool completely. Store in an airtight container until ready to use. The crumbs will keep at room temperature for 3 days, or in the refrigerator for a week. 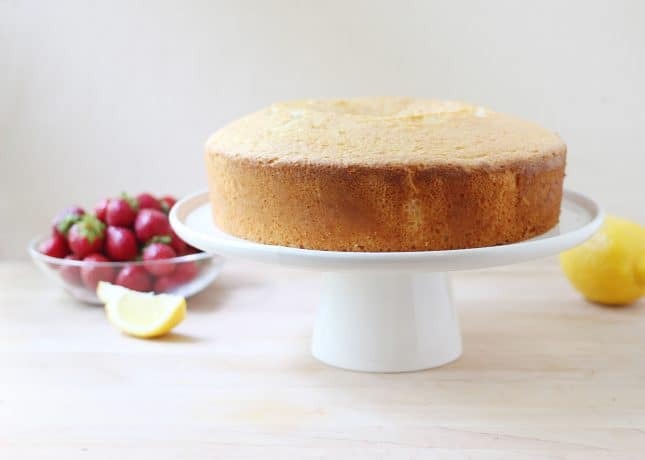 Assemble the cake (you should assemble the cake right before serving it): Place the cake on a stand or a large round plate. 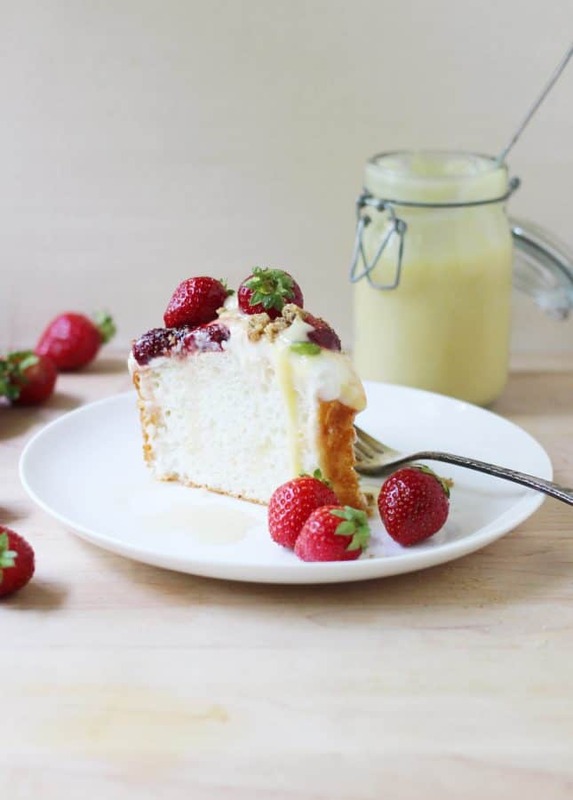 Spread a thick layer of vanilla Greek yogurt over the top of the cake, flattening the cream with the back of a spoon. Top with several dollops of lemon curd. Add the roasted strawberries, then some fresh strawberries, if desired. 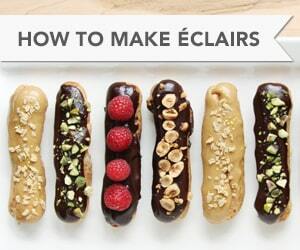 Sprinkle with pistachio crumbs and drizzle with maple syrup. Serve immediately. This cake should be served immediately it is assembled. You can prepare all the elements the day before, covering the cake pan with plastic wrap (after it has cooled completely), leaving it to room temperature for up to one day. Store the pistachio crumbs in an airtight container and leave it too room temperature. 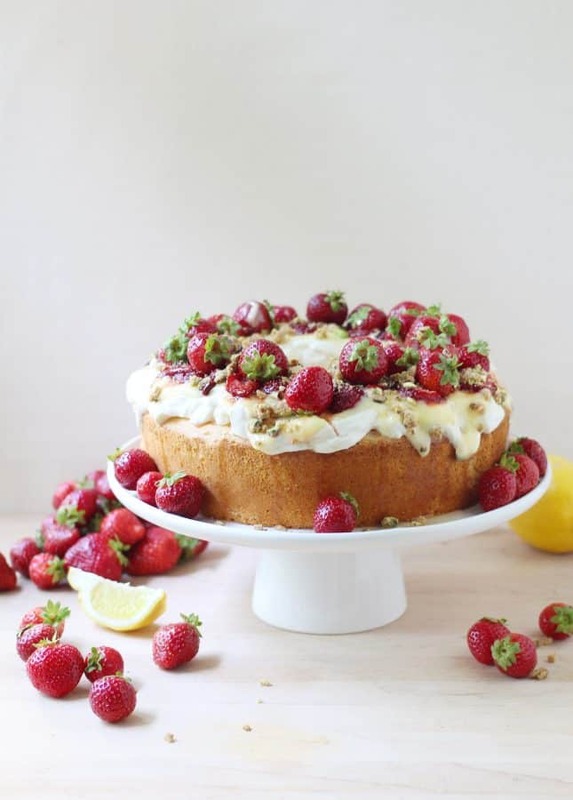 Store the roasted strawberries in an airtight container in the fridge, making sure to bring them back to room temperature 30 minutes before assembling the cake. Use chopped pistachios, or crumble dry cookies, such as amaretti cookies or pistachio biscotti instead of making your own pistachio crumbs. Feel free to use egg whites sold in a carton (such as NatureEgg Simply Egg Whites or Egg Beaters All Natural 100% Egg Whites). It’s easy and faster than separating 12 eggs! Plus, you won’t have to figure out what to do with the 12 leftover egg yolks. 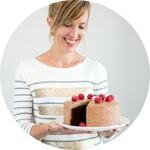 I’ve never made an Angel Food Cake before but your extremely helpful post makes me think I need to try soon! Gorgeous photos! Angel food cake is magic. Adding on roasted strawberries (a first for me, I’ll have to try that!) is genius and would highlight the lightness of the rest of the dessert, I imagine. 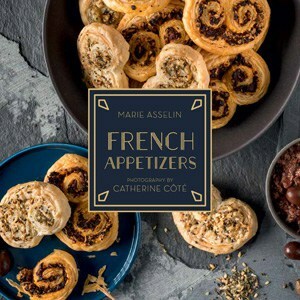 Amazing recipe, Marie! Stunning cake! 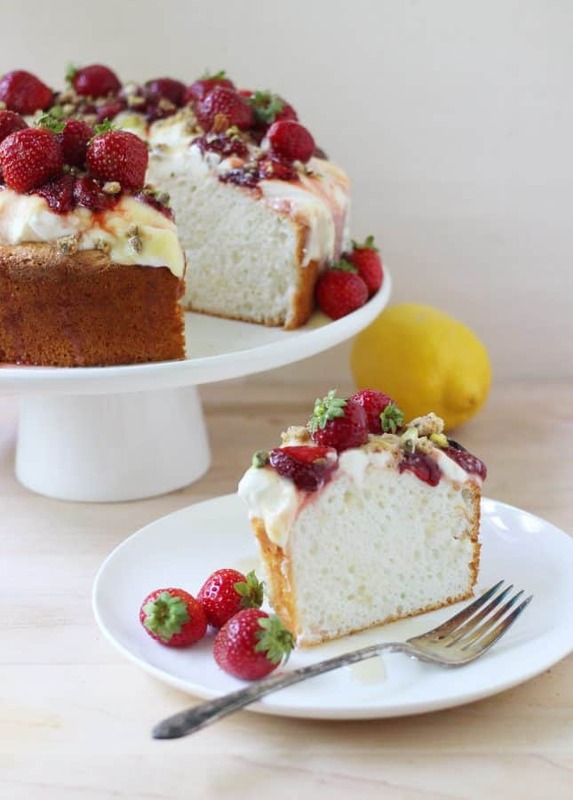 I always loved angel food cake as well and think it is just about the best cake in the world. I have never had it with roasted strawberries and I bet it is delicious! 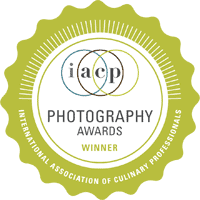 Beautiful photos as well. I’m very nearly at a loss for words here (which isn’t something that happens often). This is basically perfection. I too adore the light, ethereal texture and taste of angel food, and it goes SO well with cooked (roasted!!) fruit. I’ve been wanting to try making one for a long time, but I’ve never bitten the bullet. 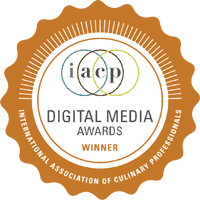 As luck would have it, I just got a nice pan like the one you used, so maybe it’s time to give it a go. Seriously, beautiful job. I love angel food cake. It is so versatile but I enjoy it with berries the most. It’s been years since I’ve made a homemade one. That is going to change. Thank you for sharing. This cake is gorgeous Marie! I bet it’s delicious!